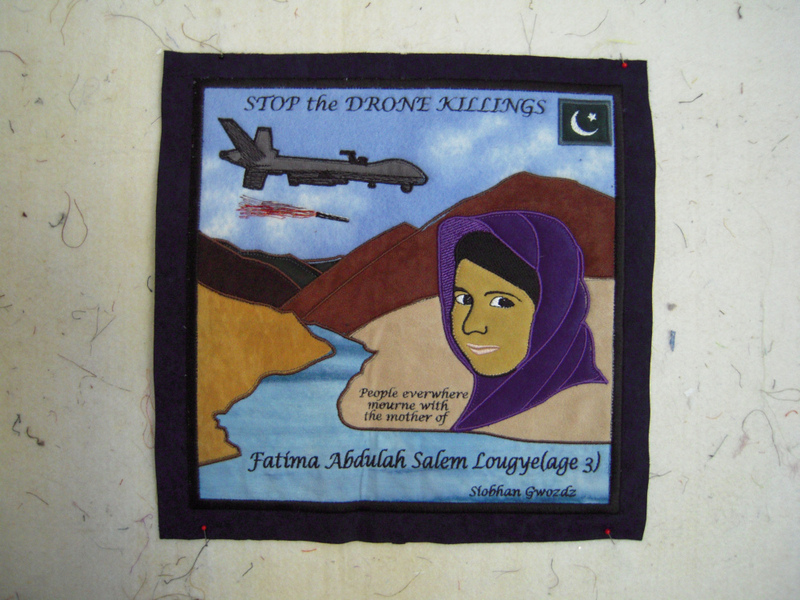 From Leah Bolger: I’m announcing the launch of the website to support the U.S. version of the Drones Quilt Project. We got the idea to create a drones quilt to memorialize the victims of U.S. combat drone strikes from a group of women in the UK. I thought there would be plenty of interest in the U.S. to create a quilt of our own, and I am right. I have assigned about 185 names and have received over 40 completed blocks. Soon we will begin sewing the blocks together to create panels of quilt blocks. I will be creating educational information about drones which will accompany the quilts as part of a traveling exhibit. Here is the website to support the project: www.dronesquiltproject.wordpress.com I have posted photos of all the blocks I have received so far. The website also contains information about creating a block, anti-drone resources and endorsing organizations. Please help me promote the Drones Quilt Project by passing along the website: www.dronesquiltproject.wordpress.com and follow the project on Twitter: @dronesproject. This entry was posted in community event, drones, Veterans for Peace. Bookmark the permalink.